Well, I finished the hats. Yes, hats. There were three of them. Two in Noro and one in, uh, hmm. I sort of…forget. I was in a hurry, you see. Also, I was on Vicodin and thus perhaps not thinking clearly. So you’ll just have to envision two hats in Noro here, and one in a very soft, very warm wool that is gently variegated blue and gray. This deceitful little number is one of the ones which starts with an innocent “Cast on 7 stitches” and then proceeds to grow and grow and grow as you go along. The row that took less than a minute at the start is now taking ten minutes and still it is growing. This red wool has been sitting in my stash for about four years now, waiting for me to come up with something to do with it. It is a wool for grownup people who understand how to treat wool – hardy, yet fragile. With proper treatment, this shawl could last for many generations. My great-great grandchildren will be arguing about who gets saddled with to keep great-great-gran’s mangy old shawl. But if it is tossed into a washer even once, it will become a very nice felted tea cozy. So I’ve decided that this one will be for me. This winter, I will prove just how dorky I am by wrapping it around myself when I dash out to pick up the Denizens from school. They will be mortified when they see me coming – which they will, because this red can be seen from about eleventy-million miles away. This red right here is what they’re talking about in Proverbs when they say, When it snows, she has no fear for her household; for all of them are clothed in scarlet. I love that pattern! I made one for my mom (also red, although perhaps a bit more...um...subdued) and I liked it so much I made myself a heathery purple one. 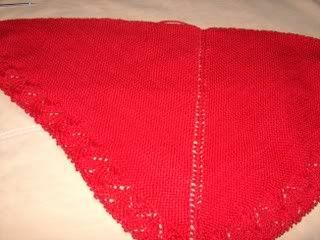 I rarely make the same thing twice, but for this shawl is was a pleasure. That is an excellent color--and you're right, only someone who can appreciate wool should be able to wear a shawl like that.. Very pretty! Almost makes me want to take up knitting...me, the gal who can only do straight knits or purls. HA! Ok, the moment has passed. Enjoy it, I love the sassy red!